square or rectangular piece and sew on fabric “pockets” to store things like paintbrushes, pencils, rulers, and more. Transform thick PVC piping into craft paint organizers. Simply cut the pipe to the height of the paints and turn it on its side. Stack the pipes and use glue to create a “storage unit”. Upcycle old tin cans by painting them or wrapping them in patterned paper to create tin can containers. Use them to store your pens, pencils, glue sticks, scissors, and more. Transform an old filing cabinet into a fabric storage cabinet. Instead of sliding files between the dividers, slide different types of fabric. Or drape the fabric right over the dividers. Use tic-tac boxes to organize your rolls of ribbon. Simply take the lid off, place your rolled-up ribbon inside, and feed the end through the dispenser opening before placing the lid back on the box. Store all of your loose craft items in different sized Mason jars. This includes things like buttons, bobbins, quilting squares, sequins, glitter paints, and more. Invest in a large pegboard and turn it into a pegboard tool holder. Attach some hooks and hangers and store things like needle-nose pliers, hammers, paintbrushes, and more. If you have a lot of glitter paints, create a glitter paint board by attaching velcro squares to a piece of wood or a picture frame and velcro squares onto your paints. Then, just press them to the board for storage. Turn an old ladder into a fabric organizer. 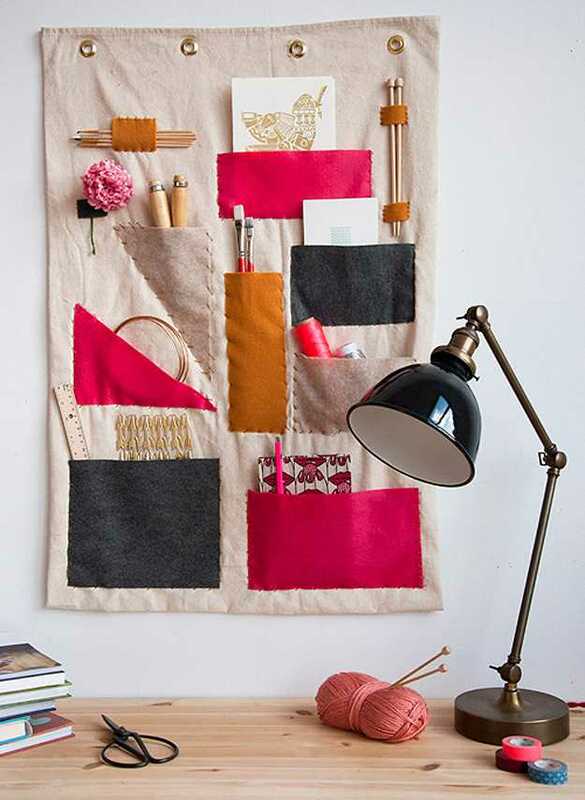 Simply place it up against the wall and drape your various fabrics over the rungs so you know where everything is. Create your own teacup pin cushion: Cut a piece of circular scrap fabric, place some stuffing in the middle, then gather up the ends and tie them up. Then, simply place the pin cushion in an old teacup. Instead of stacking your scrapbook paper and leafing through it when you need a certain kind, create a scrapbook paper organizer using a simple tabletop file organizer. Turn an unused spice rack into a craft paint caddy. The openings for the spices are around the same size as the paints, so they’ll fit perfectly and you’ll know where each color is. Cut empty cereal boxes into several different sizes and use them as drawer organizers. You can even paint them to make them more fun. If you have a variety of wrapping paper rolls, grab a plastic suit bag and stack the rolls side-by-side in the bottom. Then, zip up the bag, insert a hanger, and hang the whole thing up in your closet. Use an over-the-door shoe organizer to hold things like mod podge, glue, ribbon, markers, and other craft supplies. This entry was posted in DIY and tagged crafts, DIY.